Horror gamers can exhale in relief. Perception, a fresh take on haunted house horror starring a blind woman, has met its funding goal. The game ended its campaign at $168,041—a total that only skimmed the top of a deep pool of stretch goals. In the projected June 2016 release, players can expect globe-spanning localization, an extra area to explore, and True Darkness mode, where the player is restricted to echolocating without her loud cane. Of course, included as well is a fully voiced campaign—well, that is unless you choose to play the recently announced Silent Night mode, a version of the game that shushes an otherwise chatty playable character, except on plot critical lines. The option emerged from a significant amount of player feedback. Bill Gardner, creative director at The Deep End Games, announced the mode in a recent update video, saying that some players “wanted a more traditional silent protagonist.” The update ends with a Silent Night version of an earlier, fully voiced, gameplay trailer. 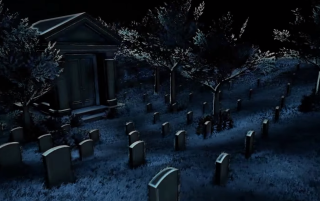 In both videos, the protagonist stumbles upon a graveyard and some aggressive wraithlike foes. The primary difference is that her comments are limited to reactionary shrieks rather than the thinking-out-loud commentary of the original trailer. Having watched both videos, I preferred the Silent Night trailer to the character’s nearly enthusiastic responses to the supernatural phenomena happening around her. But I can only wonder how much of the intended story will be lost without the bulk of the voiceover narration. Will there be enough environmental cues and storytelling devices to allow the player to fill in the gaps? Or is this mode meant to eschew the narrative entirely, to allow for horror players to get their spooks in without lifting any heavy mental weight? We’ll find out when Perception takes a shot in the dark next summer.